South Dakota Corn Growers Association (SDCGA) is among the most active commodity groups in the state, serving as a powerful legislative voice for South Dakota corn producers. We work to promote corn and improve producer profitability; influence public policy and legislative efforts; educate South Dakota consumers; and increase corn usage through livestock feeding and new domestic products that improve the quality of life in a changing world. South Dakota corn producers formed the SDCGA membership organization in 1986 to serve as a collective voice on legislative issues on the state and national levels. SDCGA successfully lobbied for the formation of the South Dakota Corn Utilization Council and the state’s One-cent Checkoff program in 1988. 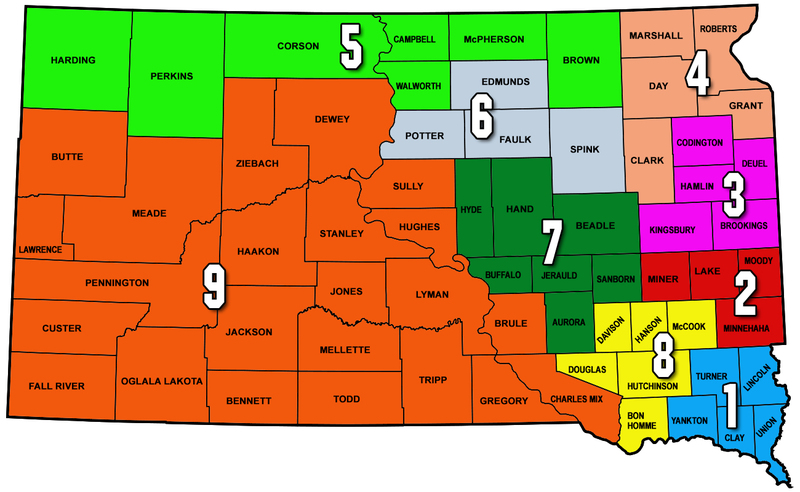 The state is divided into 9 districts for representation. SDCGA board of directors consists of 12 producers who are elected by fellow South Dakota corn producers from their respective districts. SDCGA directors are elected at the SDCGA annual meeting in January. SDCGA is involved with all legislative issues, yield contests, membership recruitment and other promotional activities. We also manage South Dakota Corn Growers Association’s political action committee, CORNPAC. SDCGA meets annually to pass resolutions and hold board elections. County organizations enable the SDCGA to serve as a true grassroots organization.